Shirt signed by Attilio Lombardo, must have been first half of 1998/99 season and acquired at one of the sportman's dinners at Crystals hosted by Barry Williams and starring Roger de Courcey and "the bear" doing his adult routine. I outbid Formark Scaffolding (I think they were called - a local sponsor along with my firm then) while inebriated. I remember some explaining to er indoors the next morning. Now displayed on my eldest sons bedroom wall. Ive also got a palace v Liverpool programme in the shed somewhere signed by Robbie fowler and Steve Macmanerman who I was shoulder to shoulder with at the bar in the players lounge after a midweek games mid 1990's, when players still drank after the match. Robbie I remember was quite a jack the lad and up for a few jokes and a laugh. Hello Wilko,I'm looking for programmes from the season 1948/49 from August to December...see if md dad is in there!! 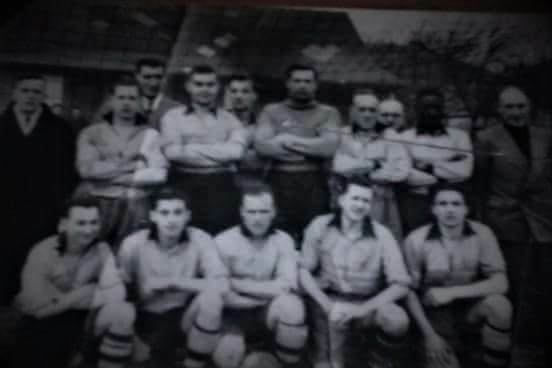 Nice to read that someone was at Crystal Palace games during the war and still healthy enough to remember and write about it.I am looking for information about my father,Jim Kearney,who played in the season 48-49...during Jack Butlers time as manager..could you help me there...by the way he was a good centre forward,in the middle of the picture with the ball.Maybe you recognize some of the other players!This is a photo of the Crystal Palace "A" team. I have got complete sets of Crystal Palace home programmes going back over 40 years and several scrapbooks containing match reports and press photos of Palace matches during the 60s and 70s (before you could buy such info. in book publications). I often have a look through them when I am feeling nostalgic about the 'old days.' Getting a bit of a problem now as the wife and I are downsizing to a bungalow and I will have difficulties in storing them all. Also got photos of my two boys when they were Palace matchday mascots and at the old Mitcham Training Ground when they were being coached by Palace players as well as a couple of signed footballs. Perhaps the greatest treasure of all is a Palace rosette with Johnny Byrne's picture on it and individual star badges with faces of Palace players pinned on it (Allen, Summersby, Uphill, Holton, Burridge, Kellard etc.). Apart from CPFC memorabilia, I have also hoarded numerous football magazines (Shoot, Goal, Charles Buchan etc.) going back years and this will add to the storage problem. Sad aren't I ? Hello,I'm looking for information on my father who was at Crystal Palace in the season 1948-49,all I can find at the moment is that he played in the "A"selection at the start of that season,his name was Jim Kearney from Belfast.If you can direct me to digital programmes from that period I can do a bit of research..I placed a call up card from Jack Butler for a friendly against Sevenoaks. You may well be, but there are still a lot of us left. My loft is packed with programmes and, as you have, newspaper cut scrapbooks. I gave up buying programmes some 15 years ago because of the room problem. It's digital ones for me now. I still really need to get up and sort the loft out before I die I have an Arthur Rowe signed programme up there somewhere. Thank you Dorking that's very kind and helpful,it is a beautiful area here and I wouldn't want to live anywhere else!Do you have family here? No I don't. My Mrs likes seeing dolphins hence we discovered it is the best dolphin centre in Europe, and have visited I think 3 times. So much more conservation there than at your typical dolphin 'attraction' - they have natural lakes and properly care for them so much more than places which are just about 'dolphin display' shows. I have just looked through my 1948-49 programmes and an early programme refers to a 'Kenney, a young centre-forward' playing for the 'A' team so it could be a spelling mistake for Jim. Later programmes refer to the 'A' team playing all their fixtures 'away' so assume they must be friendlies. Other clubs the A team played against that season as mentioned are Tonbridge, Deal and Dover so Sevenoaks a definite possibility. 1. Ron Hopgood. 2. Brian Skingley 3. Alf Noskes. 4. Johnny McNichol. 5. Len Choules. 6. Terry Long. 7. Carlo Nastri. 8. Johnny Byrne. 9.Ron Brett. 10. Barry Pierce. 11. Tony Collins. We won 9-0 hooked ever since.